These rights are contained in the United Nation's Universal Declaration of Human rights and are unquestionably considered inalienable to man's existence on earth. Democracy confers on an individual the right to free enterprise. As long as the exercise of one's right does not injuriously conflict with the right of another, one is at liberty to live one's life the way it pleases one. No wonder an American dramatist and screen writer, John Patrick, defined democracy as a system of self-determination that even allows one to make a wrong choice. The system of democratic governance was bequeathed Nigeria's founding fathers by the British Colonial government on 1st of October, 1960. Unfortunately, this system which, at the elementary stage, would entail trials and errors, was not allowed time to stabilize before the Nigerian military struck and overthrew the democratically-elected government of Sir Abubarkar Tafawa Balewa on the 15th of January, 1966. The military made itself comfortable ruling the country for thirteen years before it could return power to a democratically-elected government of Alhaji Shehu Shagari on 1st of October, 1979. Again, as if the military was full of regrets for handing over power in 1979, the Nigerian military, under Major-General Muhammad Buhari, inexplicably struck back to power on 31st of December, 1983. The military, embarrassingly, clicked to power from 1983 to 29th of May, 1999. Arithmetically-speaking, therefore, the Nigerian military had usurped thirty-three years out of fifty-three years of Nigeria's independent existence. The consequence became obvious. The inevitable learning process the country's democratic evolution and experience should have gone through in order to stabilize was, at different times, truncated. The result, therefore, is that the country's cumulative experience and maturity in quantifiable democracy only amounts to twenty-years whereas it should have been fifty-three. The process of learning, not minding what field, has always been associated with mistakes, even costly ones. The infant-child that learns to walk does not find it smooth and easy. The child walks and falls. But once he or she attains perfection, stability would be guaranteed and those initial flaws would become a thing of the past. 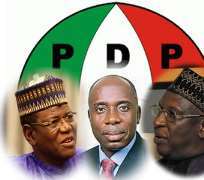 The major political party in Nigeria is currently having internal problems within her ranks. About seven governors elected on the platform of the party, for reasons best known to them, opted to form what they call a splinter faction of the party. As would be expected, the legitimate leadership of the party is not taking the unconstitutionality of this group lightly. So, there has been brawl and pandemonium within the political firmament of the country. Many critics and observers have expressed varying degrees of opinion on this development. Some pessimists even went to the extent of imaging the truncation of the country's democracy because of this brouhaha. But frankly-speaking, this is the beauty of democracy. It has, true to its components, afforded persons within the party the inalienable right to freedom of thought, freedom of assembly, freedom of expression and, even, the freedom of a wrong choice. The same democracy that accords individuals the right to hold and express divergent views also makes provision for reasonable and ultimate reconciliation and harmonization of divergent views held by members within the group. When this takes place, as it is bound to, the group emerges stronger and democracy, which encourages jaw-jaw, triumphs. This is the enduring beauty of democracy. Disclaimer: "The views/contents expressed in this article are the sole responsibility of Nnaji Obed Asiegbu and do not necessarily reflect those of The Nigerian Voice. The Nigerian Voice will not be responsible or liable for any inaccurate or incorrect statements contained in this article."